1Password. AgileBits’s popular password manager speaks for itself, so I’d rather focus on the iOS 8 changes the app went through this year. Before iOS 8, 1Password was limited to its own app: you needed to open 1Password to see your logins and secure notes, which wasn’t as fast as using the app on OS X. With iOS 8, AgileBits has built an action extension that you can invoke from any app to fetch your logins and fill required fields with one tap. With Touch ID and extensions, 1Password has gone beyond the restrictions of its app and turned into a system-wide password manager that’s natively supported in hundreds of apps. 1Password was already great on iOS 7 and the iPhone 5s with Touch ID, but the extension makes it even better. Read the MacStories review and previous coverage. Clips. 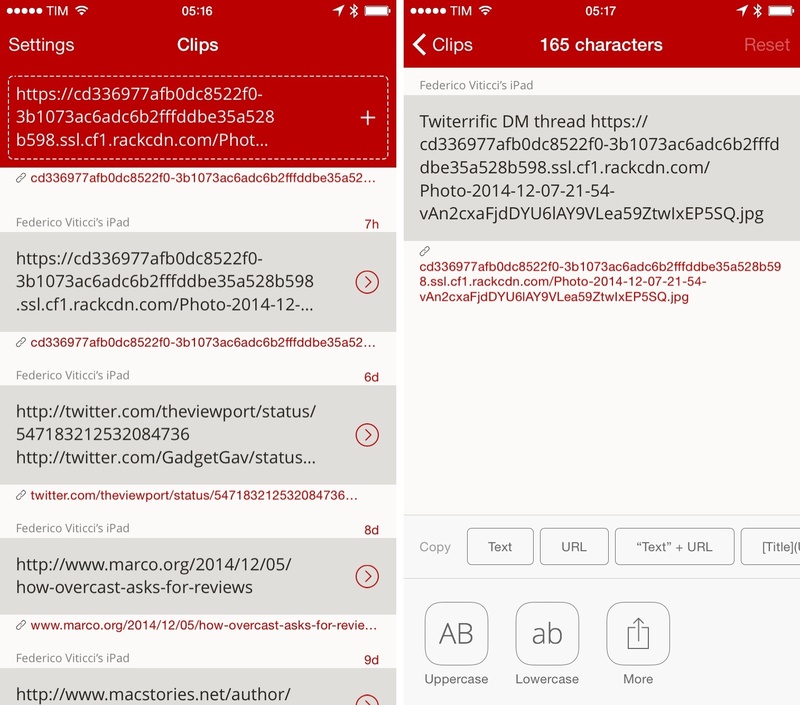 One the best new apps of the year, Clips (developed by Clean Shaven Apps) is a clipboard manager that wouldn’t have been possible without iOS 8. I never used clipboard managers full-time before iOS 8 because of the friction they put on saving text and images you copied; with an extension, a widget, and a handy custom keyboard, Clips cuts down the number of taps required to save bits of text and move them between apps. I rely on Clips when I want to move text around without manually switching between apps all the time. URLs, usernames, quotes, and strings of text that I need to take into other apps or save alongside more snippets go into Clips so I can be faster. I use Clips every day to be more efficient when composing articles and assembling lists of links and notes, and it’s a great example of the kind of change that iOS 8 brought to my workflow. On my iPhone, Clips sits on my Home screen and I use it to share image links with my iPad and to store multiple bits of text I want to tweet at once. Dispatch. Also by Clean Shaven Apps, Dispatch is a full-featured email client that lets me turn messages into actions or shareable items thanks to support for native extensions and custom sharing services. Readers of MacStories know that this is a major frustration for my workflow: I want to be able to take action on email messages with todos, PDFs, or perhaps automated workflows, but Apple’s Mail app doesn’t have access to any of iOS 8’s new extensibility features. Dispatch can show the system share sheet for messages, which lets me easily save emails into Todoist or attachments to a cloud service. Furthermore, Dispatch is full of other great details such as automatic salutations, native TextExpander integration, custom gestures, and the ability to add attachments and upload them to Dropbox before sending a message. I prefer doing email on my iPhone thanks to Dispatch, and I can’t wait for an iPad version. Drafts. 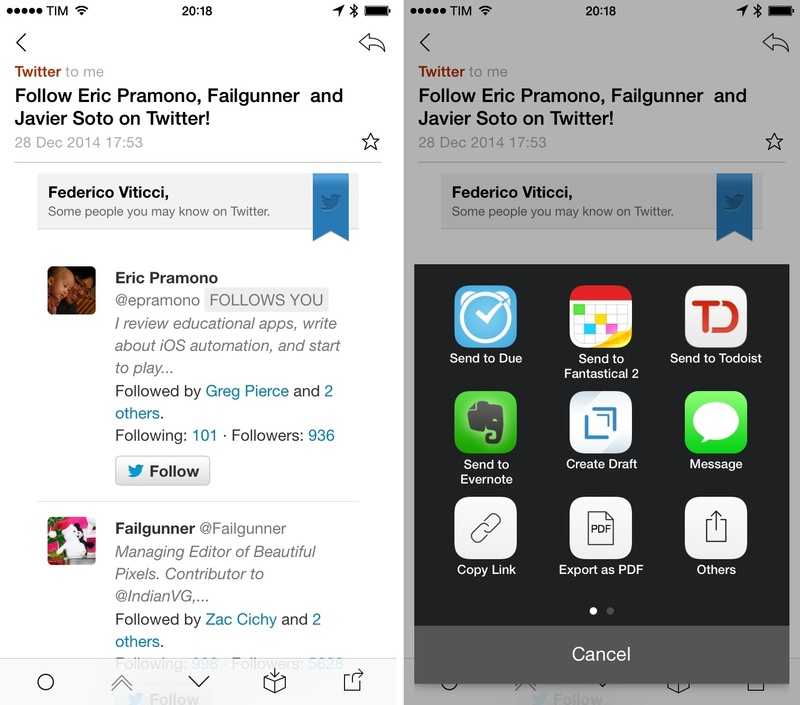 A returning entry in my annual roundup, Agile Tortoise’s Drafts was relaunched as version 4.0 for iOS 8 with a focus on making it easier to share text quickly to any app or service you want. Drafts looks like a quick notepad, and it can be used as such; its full depth, though, is only revealed when using advanced functionalities such as action steps (a GUI for combining app actions together), customizable script keys, and a share extension to save text from anywhere. Drafts helps me capture text from Safari and send it to Slack through Zapier, save Markdown notes to Evernote as HTML, and share notes to extensions with variables for dates, location, and more. 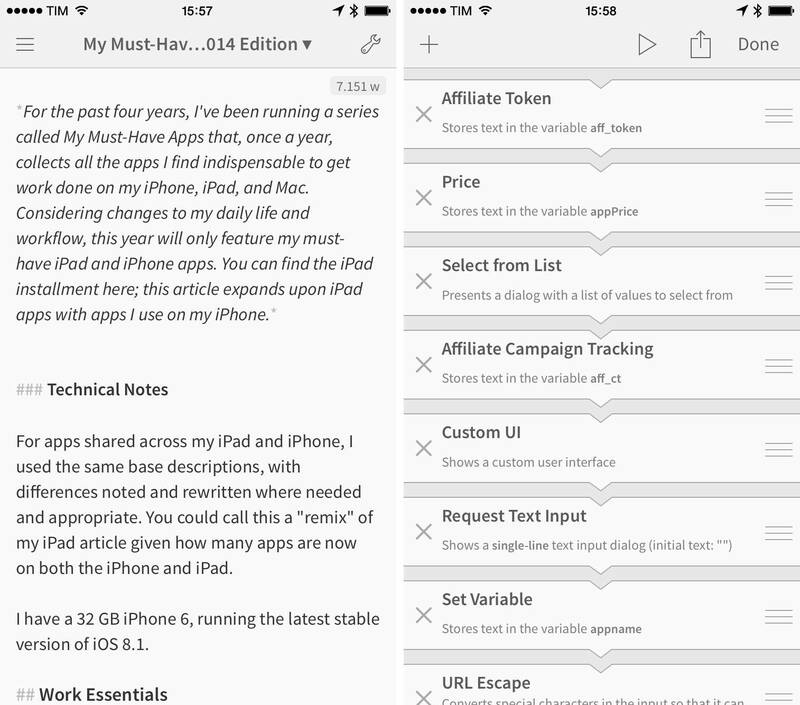 Drafts is an elegant and automated note-taking app with no equal on iOS. Dropbox. My online filesystem and a sharing service for all platforms, Dropbox is where all my important files are stored and archived. All my articles begin and remain in Dropbox as plain text; my PDF documents are organized in folders and available on all my devices; images and videos I want to share live in Dropbox. The iOS app was updated with renaming features, and, while not revolutionary by any means, Dropbox for iOS gets the job done. Editorial. Developed by Ole Zorn, Editorial started as an iPad app and was ported to the iPhone earlier this year with version 1.1. Editorial is, on the surface, a Markdown-powered text editor with a built-in browser and good integration with Dropbox. Editorial’s true power, though, lies in the advanced automation features to speed up text editing tasks, web research, and just about any other inter-app communication aspect of iOS. Editorial pioneered workflow automation on iOS by mixing Markdown with accessible Python scripting exposed through actions. Reminiscent of Automator, Editorial has enabled me to create workflows that go beyond text editing/formatting and span iTunes integration, Twitter and RSS actions, custom user interfaces, iCloud Tabs, and other services and APIs that aid me in creating, editing, and publishing articles. I don’t use Editorial for iPhone as much as the iPad version – I don’t write on the iPhone, and most of my automation is done on the iPad. I do, though, use Editorial for iPhone quite a bit to run @MacStoriesDeals (if I want to tweet a couple of app deals quickly when I’m at the grocery store, for example) and insert screenshots that I then preview on the iPad. Editorial for iPhone is as powerful as the iPad app, and I know I can count on it (I’ve published some linked posts using the iPhone version). Evernote. I’ve been using Evernote for years and I depend on the service for notes that include formatted text and inline attachments. Evernote has become more complex with time, but I still use it for fairly basic reasons: it lets me save screenshots as notes, it lets me annotate them, it supports rich text without being limited to plain text, and it’s integrated with dozens of apps that can append content to existing notes (something that I do a lot). These options allow me to save research for my two podcasts in Evernote and ensure that I can always save text quickly using apps like Workflow and Drafts or web services like Zapier. I also appreciate Evernote’s search, OCR support, and collaboration features. I keep various shared notebooks with my girlfriend for home projects and our side business, and, in spite of occasional hiccups and a constant fear of feature creep, Evernote’s ubiquitousness still make it the best solution for what it does. Fantastical. 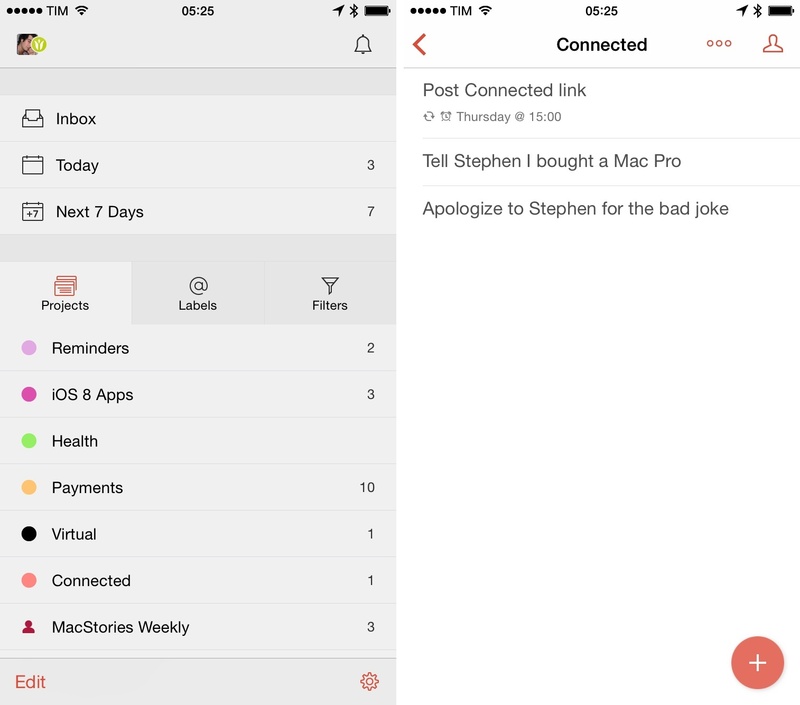 Despite the fact that I switched from iCloud Reminders to Todoist, I haven’t abandoned Flexibits’ Fantastical. When it comes to managing and viewing my calendar events, Fantastical still provides a fantastic balance of versatility and understandable interface: the app can add events with natural language, which is the best implementation I’ve found on iOS; to view my schedule, I’m a fan of the app’s Today widget (in expanded mode) and clever use of color and animations in the DayTicker. Fantastical is my favorite calendar app ever made for iOS and it absolutely shines on the iPhone thanks to its speed and ease of use. Google Docs. 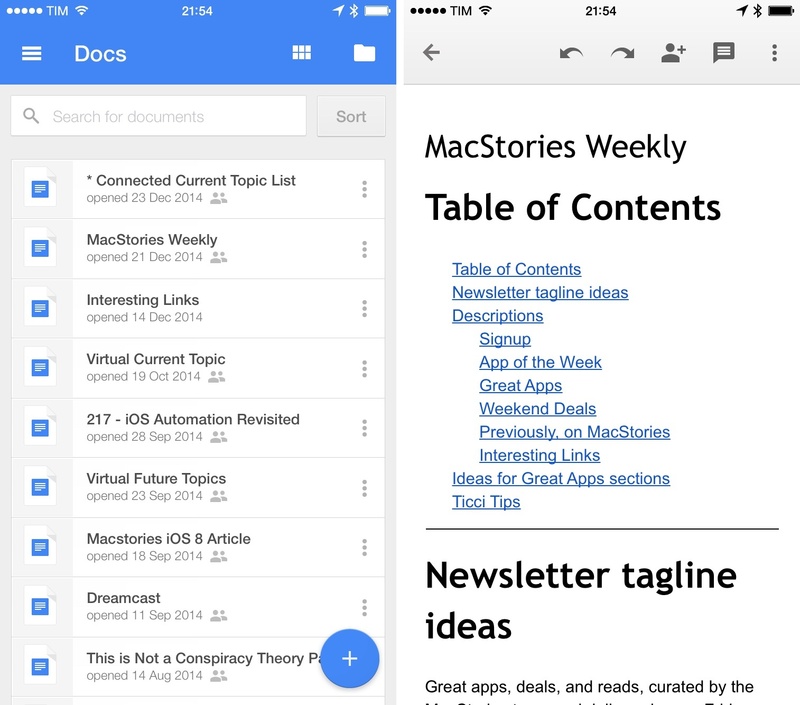 Like Evernote, Google Docs is the best in its class. We use Google Docs for episode research and notes at Relay: all our episodes start as rich text in Docs, which offers a collaborative editing environment with real-time changes (you can see the cursor moving), support for clickable hyperlinks, and terrific speed and reliability. On iOS, Google Docs doesn’t come with all the features of its web counterpart (chat is missing) and it hides some necessary controls more than necessary (I’m looking at you, indent/outdent buttons), but it works well overall, and I need it on a daily basis. Launch Center Pro. 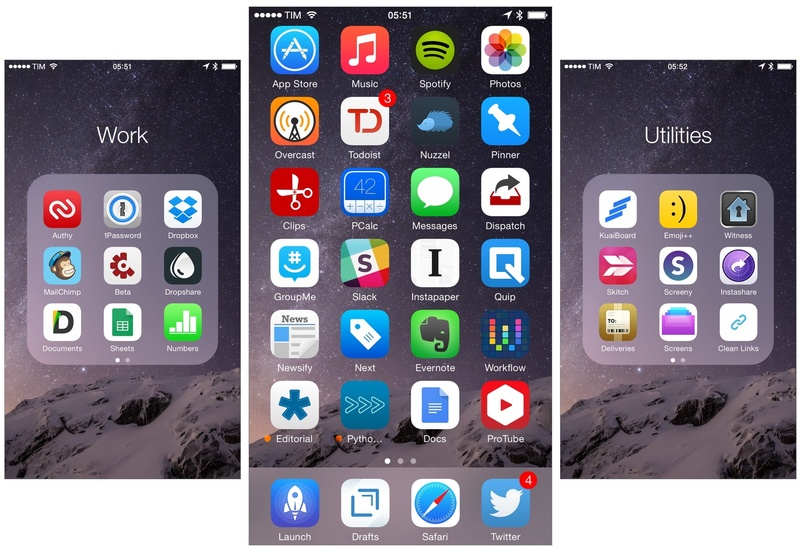 Contrast’s shortcut launcher didn’t go through any major rewrite for iOS 8, but it doesn’t matter. For me, Launch Center Pro is still the fastest and most convenient way to launch actions and apps on my iPhone. I can type a search query and open it in Google; I set up shortcuts to launch workflows in Workflow, optionally passing clipboard content to them; and, I need Launch Center Pro to open URLs and download files with one tap. Launch Center Pro speeds up tasks on my iPhone considerably, and its integration with iOS through photos and the clipboard is top notch. Next. For years, I went without an expense tracker and thought that I could manage my expenses just by remembering them. That was silly. Earlier this year, after testing several expense trackers for Mac and iOS, I settled on Next, a fast and functional expense tracking app by noidentity. I use Next for iPhone to quickly enter expenses as I love how the app cuts down the process to two steps. Next makes clever use of color and sound effects to highlight interaction and provide feedback: every time I pay for something, I grab my iPhone, open Next, and I have an expense with a description saved in my history. Next is intuitive, polished, and functional. Pythonista. Ole Zorn’s original foray into iOS automation, Pythonista is a Python interpreter for iOS that mixes scripting with native iOS functionalities such as photos, location, the clipboard, or the ability to open URLs – all while taking advantage of Python to let you build real scripts that are uniquely optimized for iOS. Pythonista reinvented my workflow two years ago, and while many of its functionality has been supplanted by the visual approaches of Editorial, Workflow, and Drafts 4, I still use the app to automate my screenshot generation techniques and upload images to our CDN. When I want more from iOS and extensions aren’t enough, I know that I can count on a manual solution in Pythonista. I think it’s especially impressive that, just six years after the launch of the App Store, you can run Python scripts on your phone. Todoist. I started using Todoist this year when my professional life got busier, and I was surprised to find a task management app that perfectly suited my needs. Todoist is cross-platform, has collaboration features to share projects with other users, and supports natural language input for quick and intelligent task creation. With a clean design, Todoist hides advanced functionality that is always there when you need it, such as filters for specific views, an open API, file attachments and comments for tasks, and the ability to visualize your productivity over time through charts and points. Full iOS 8 support was the proverbial icing on the cake, with a widget to complete tasks from Notification Center and an action extension to create new todos from any app that can show a share sheet. Workflow. 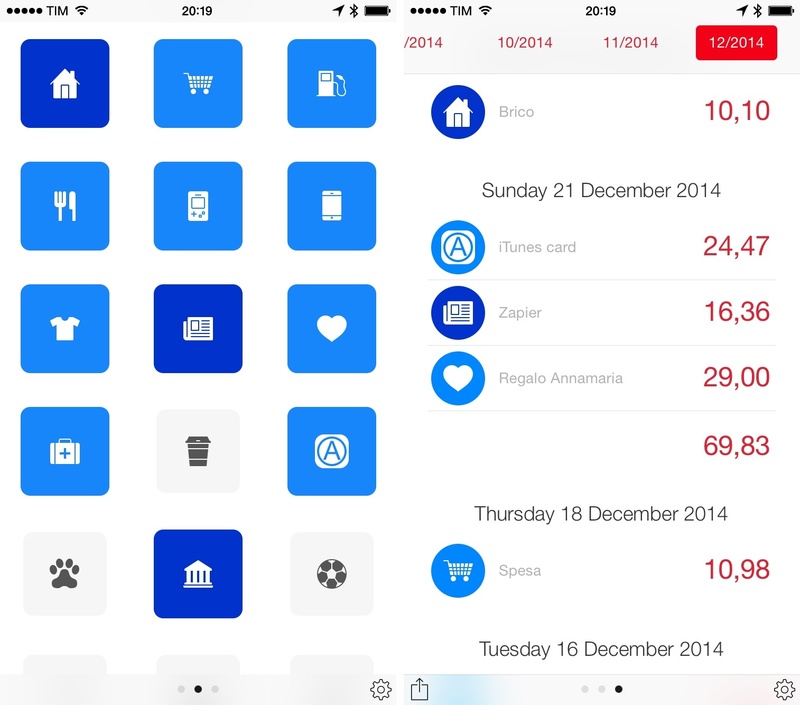 Recently released on the App Store, Workflow has already raised the bar for iOS automation. I started using Workflow, developed by Ari Weinstein and Conrad Kramer, back in August, when they asked me to check out a workflow automation tool inspired by Automator on OS X. Workflow goes way beyond that promise – not too dissimilar from Editorial’s – by blending native iOS system features with an easy to use interface and user-friendly approach to task automation. In Workflow, you can combine actions that support iOS features such as taking photos, accessing the photo library, opening URLs, saving notes to Dropbox and Evernote, and more. I use Workflow to quickly append links to Evernote, open tweets in the Twitter app, generate PDFs, download and share files, and even annotate screenshots. And all this while integrating with iOS 8 through document pickers and an action extension that brings workflows to any app that can share content through the native share sheet. I use Workflow for iPhone to quickly append text to my clipboard and share links across apps, and it truly is an automation must-have on iOS. Linky. 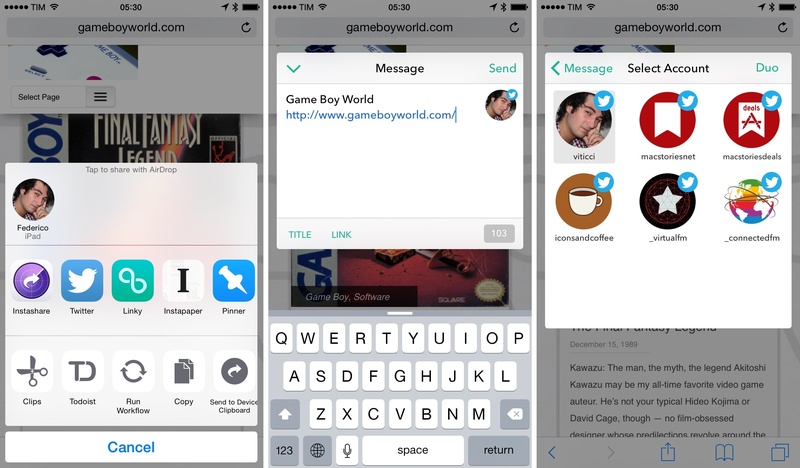 A supercharged social share sheet for iOS 8, Linky offers more options to users who regularly share links on Twitter and Facebook. I use Linky in Safari and RSS a lot: Linky can automatically fill its compose box with a link’s title or text selection from Safari, and it shows a character count to keep tweets under control. There are some great touches in the app’s universal share extension: you can opt to enclose text clipped from Safari in quotes and there are buttons to select a link’s title or URL. Linky supports multiple accounts, cross-posting to different services, and it’s a much better social sheet than iOS’ built-in one if you share from multiple apps every day. Paper. Facebook’s alternative client for iPhone has become my favorite way to read Facebook and interact with friends on a daily basis. I don’t peruse Facebook as much as my friends and family do, but I do enjoy keeping up with status updates from people I know in real life and articles from websites I don’t follow on Twitter or via RSS. Paper is gorgeous and easy to use, with intuitive and comfortable gestures that allow me to quickly navigate between profiles and web views. 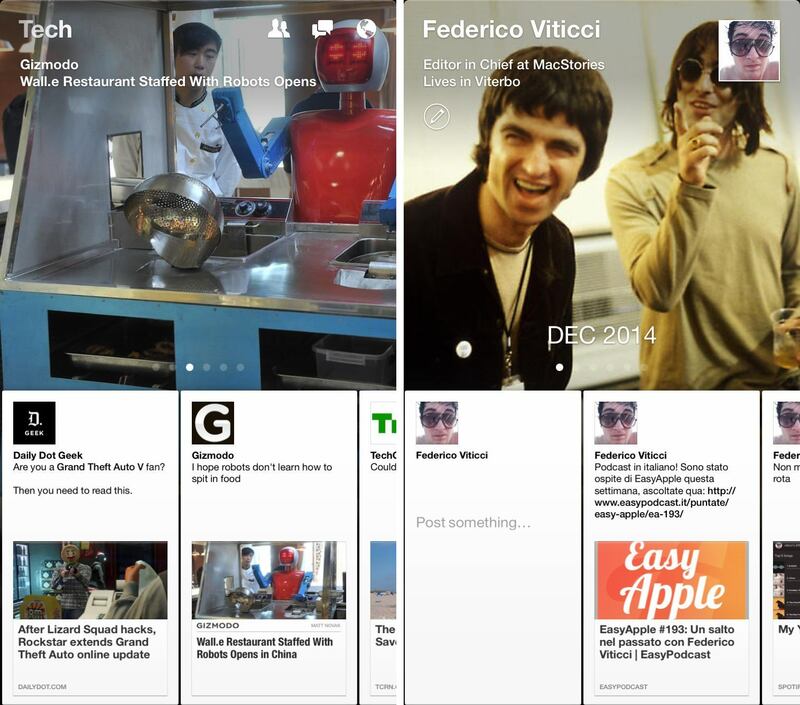 I find Facebook Paper to be the best Facebook experience yet. Slack. We use Slack for team communication at Relay. Besides speed and reliability, I like Slack because it tries to generate previews for any kind of link or file that is shared in a group chat and because of its integrations with external services and apps. I can connect Slack to Zapier and post links and messages in specific channels or private groups without even opening the app thanks to Drafts, which lets me save time I’d otherwise spend looking at messages and perusing the Giphy shortcut. Slack for iPhone is pretty good and I like its multiple options for attaching pictures to threads. Twitter. After a long exploration of popular third-party clients for iOS still left in 2014, I decided to promote the official Twitter app to my primary client on the iPhone and iPad. Twitter has changed a lot since the days of Tweetie and the original Tweetbot, and, after giving the Twitter app a fair shot, I’ve come to enjoy many of its modern features such as Cards, the ability to share multiple photos and GIFs, image sharing in DMs, and more. Twitter for iPhone always gets the latest features and design improvements, such as redesigned profiles, the ability to share tweets via DM, and full DM history. 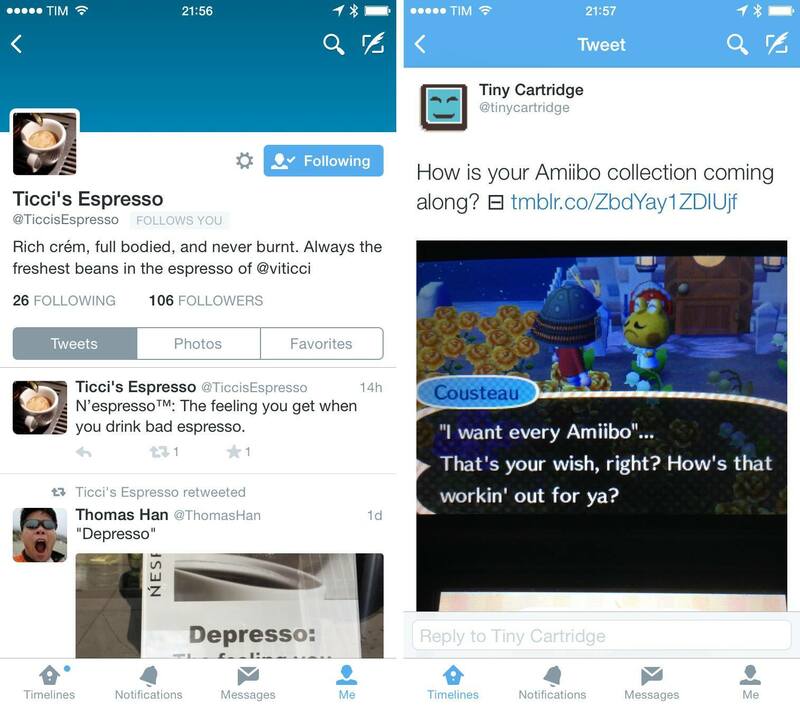 The app is, in many ways, the real mobile Twitter, and it’s by far my most used iPhone app. WhatsApp. Like Paper, I don’t use Facebook’s WhatsApp several hours each day, but WhatsApp is huge in Italy and I have to use it because that’s where my friends are. Especially in the past two years, I’ve discovered that my friends prefer being contacted on WhatsApp even if they have iMessage – they trust the app and are comfortable with it. WhatsApp isn’t too bad: it only received an iPhone 6 update in November, but it’s fast, it lets you share pictures and audio clips (also very popular here) quickly, and it supports group messaging. I don’t love WhatsApp, but I have to use it to stay in touch with people. musiXmatch. A great way to find officially licensed lyrics for songs on iOS, musiXmatch helps me follow along songs I’m listening to thanks to a beautiful display of accurate lyrics. Even more impressively, musiXmatch added an iOS 8 widget that can display lyrics from songs playing in the Music app directly in Notification Center, loading them in real time as a song goes. musiXmatch is fantastic on the iPhone, which I regularly use to listen to music using iTunes Match; it’d be great if the company could figure out a way to load lyrics for Spotify playback as well. Overcast. Marco Arment’s podcast client has become my favorite take on the genre because of its elegant design, recommendation section, and Smart Speed. The latter is a genius addition to the traditional podcast listening experience: rather than playing episodes at altered speeds (that inevitably create audio artifacts and just sound strange), Overcast can make episodes shorter by eliminating moments of near silence. Thanks to this feature – an important technical achievement by Arment – Overcast makes me save time without making my favorite podcasts sound odd or unnatural. Overcast may not have all the features of competing apps, but its audio engine is all I need to keep using the app. Shazam. The iPhone version of Shazam is the definitive take on the app: anytime I’m hearing a song that I want to tag for later, I grab my iPhone, launch Shazam with Launch Center Pro, and I let the app listen for me. I have tagged hundreds of songs in Shazam over the years, and I’m particularly impressed with the latest design changes and native Spotify playback. Songkick. I’m a music lover, and I love going to concerts. Songkick is an alert system for new live performances of my favorite artists: once it has built a collection of artists I want to track by looking at my local Music library, Facebook profile, and Spotify account (all optional, but that’s where my music information is), Songkick tells me when an artist is playing nearby or in other areas I’m interested in through a push notification. Songkick has a useful Concerts view to see the full schedule of upcoming concerts by artists I’m tracking, it integrates with apps like Sunrise to insert events in the calendar, and it even recommends artists I may want to check out based on my tastes. Spotify. After trying Beats Music for a couple of months as a replacement for Rdio, I moved to Spotify because of its superior iPad app and addition of family subscriptions. However, I do most of my listening in Spotify for iPhone when I’m cooking, doing household chores, or driving. 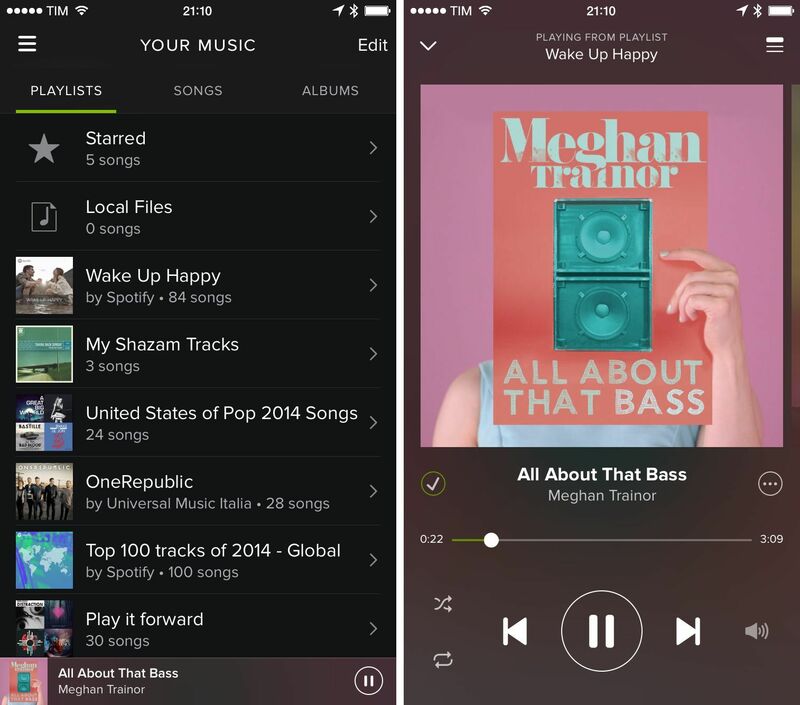 Spotify for iPhone uses a hamburger button to handle navigation across sections as well as back and forth between views: swipe on the left edge of the screen to navigate; swipe on the button in the top left to always show the sidebar. I found this confusing initially, but handy over time. I also like the playback controls of the iPhone app: the currently playing song is indicated with a mini player at the bottom, which you can tap to show the full playback screen. Dropshare. A recent addition to my arsenal, Dropshare was the missing element of my iOS workflow: an app to upload images to Rackspace Cloud Files. Dropshare, previously launched on OS X, can upload to Rackspace and Amazon S3, and it puts the public URL to a file directly in your clipboard. Dropshare integrates with any image file you can share on iOS thanks to a share extension: this allows me take screenshots on my iPhone, stitch them together with Pythonista, and upload them to Cloud Files without using a script. Once I have the link in my clipboard, I can insert it in Editorial, which will sync back to my iPad. With Dropshare, I’ve been able to eliminate scripts I used to run on my iOS devices and Mac mini server. I’m faster at uploading screenshots for blog posts now, which lets me focus on something else. Flic. I take a lot of pictures with my iPhone (sometimes more than necessary) and I’ve developed a habit of going through my photos to delete the ones I don’t like. Doing so with the built-in Photos app isn’t fun because the ability to select multiple photos is relegated to thumbnail previews: instead, Flic “gamifies” the process of deleting photos by adopting a Tinder-like UX to do so with quick gestures. As the app’s name suggests, you delete photos with flicks: a swipe to the left puts a photo in a temporary holding tray, and brings up the next one. As you go through your photos for each month, Flic will then let you delete multiple photos at once and continue cleaning your library. I run Flic almost weekly and it’s become my favorite way to clean up iCloud Photo Library without manually selecting photos. Metapho. All the pictures I take with my iPhone contain hidden information that I don’t want to share such as timestamps or details about my location based on GPS. 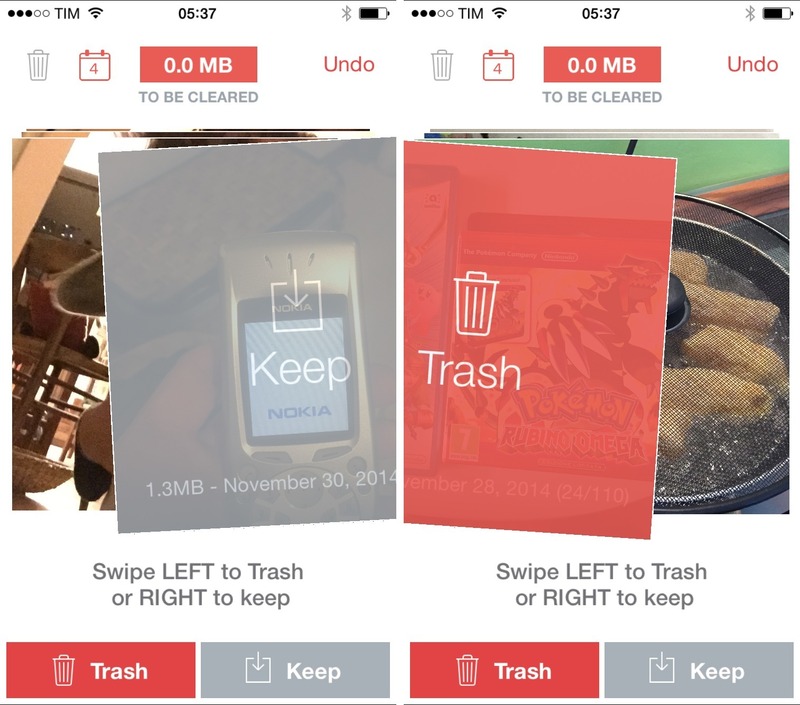 Since the release of iOS 8, Metapho has become an invaluable tool for my sharing needs: Metapho integrates with the Photos app with an editing extension that can remove metadata without duplicating files in the library. Alternatively, Metapho can share a photo with no metadata by using the system share sheet without editing the photo, which is a nice way to share pictures free of private information without having to edit a photo first. Photo Flashback. Since migrating my entire photo library (over 8 years of photos) to iCloud Photo Library, I’ve been looking for a replacement to the old Everpix Flashback feature (also implemented by Picturelife and, recently, Dropbox Carousel). Photo Flashback does exactly what you’d expect: it shows photos taken on the same day in the past. I love being able to easily rediscover memories through old photos, and the app also has a widget to view photos in Notification Center. I’d like for Photo Flashback to implement features such as the ability to exclude photos from the current year and different views (like list or map modes) but, overall, it’s unique in what it does. Screeny. For years, I accumulated screenshots on my iPhone and had to regularly delete them manually by selecting them one by one. 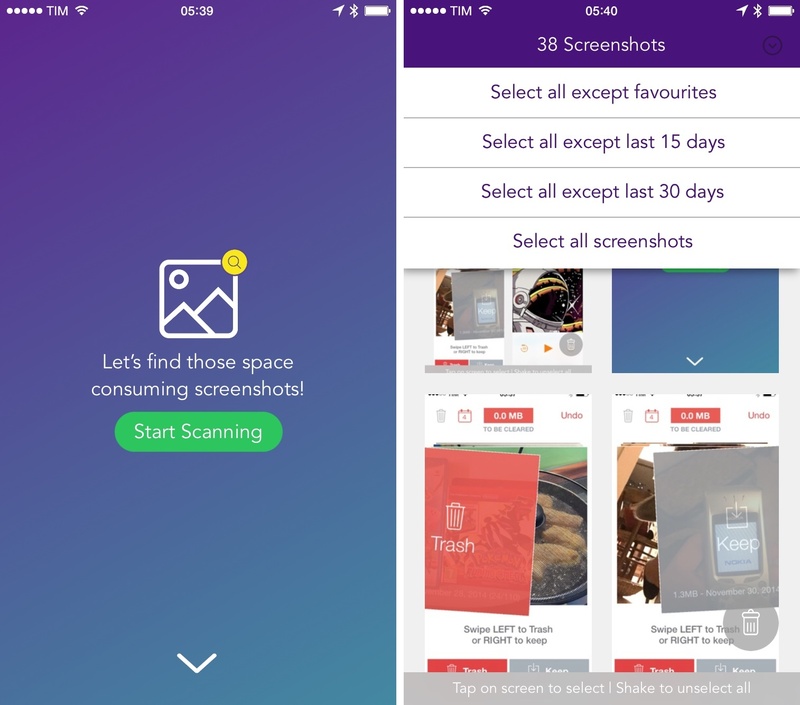 No more: with iOS 8, apps can request to delete items for you in the Photos app, and Screeny takes advantage of this feature to filter screenshots and wipe them from your Camera Roll. Handy, fast, and a must-have for me because I take dozens of screenshots on a daily basis. Skitch. Evernote’s image annotation tool, in spite of its lack of an update to support iOS 8’s extensions, still offers great editing features. Whether I need to add an arrow to call out an element of a screenshot or obfuscate personal information for a blog post, Skitch has an interface that offers just the right amount of controls. I’d love to see a Skitch photo editing extension at some point, bringing the power of Skitch to the Photos app. Instapaper. After a year spent using Apple’s Reading List, I went back to Instapaper as my read later app of choice. I missed Instapaper’s beautiful clutter-free layouts and its built-in network of recommendations. 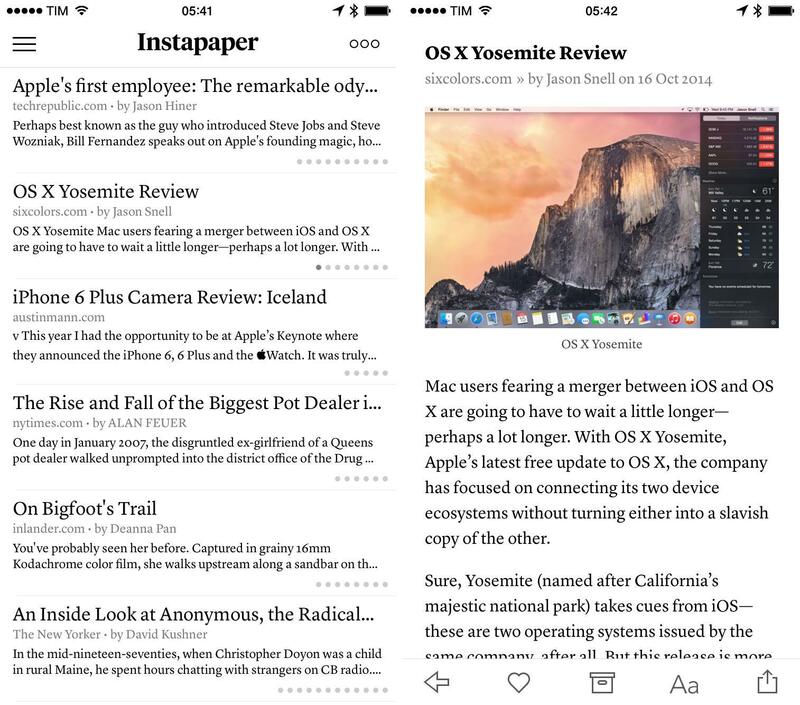 Instapaper was updated with a share extension for iOS 8, which lets me save articles with a consistent menu from any app. Instapaper is the best reading environment for me, and I like the improvements that went into the new share extension. MacHash. I go through my RSS feeds every day, but I don’t want to add every single Apple blog I follow to my subscriptions. MacHash lets me keep on top of Apple news with a dedicated app: it’s an aggregator for Apple news using a variety of blogs (including MacStories) as sources. I’ve been reading in MacHash for years: I can include/exclude websites from the list of news sources, and the app can send links directly to Evernote or use the iOS 8 system share sheet. Newsify. I tried several RSS clients for Feedly and Feed Wrangler over the past year (including an excursion into the land of New Digg) and I settled on Newsify, developed by Ben Alexander. Newsify isn’t often mentioned by websites and writers I follow, but it offers a good mix of features I value in an RSS reader: light/dark themes; a sidebar where I can quickly access subscriptions and folders; full-text article search; the ability to swipe anywhere on the screen to navigate; and, a tap & hold shortcut for the iOS 8 share sheet. 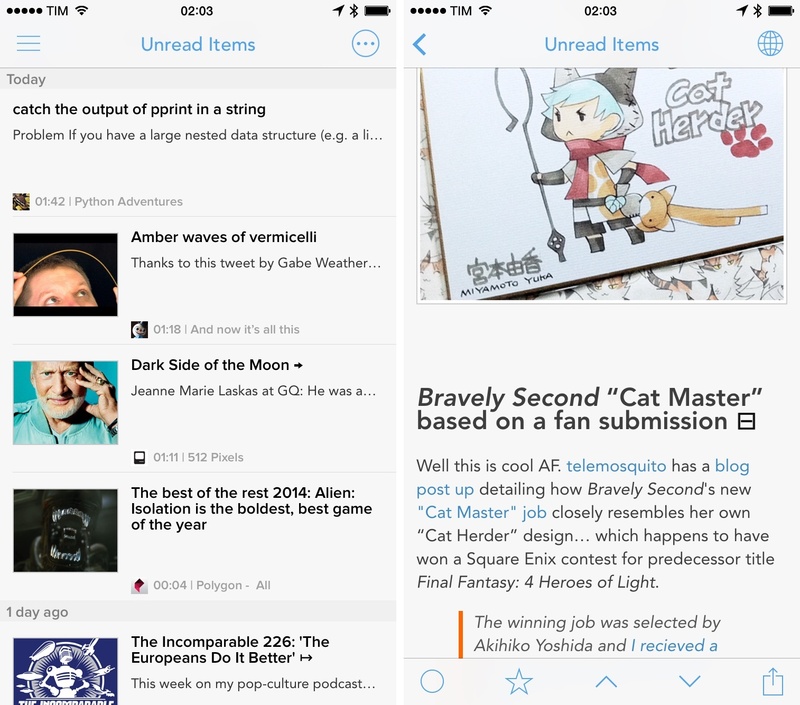 Newsify looks good, it’s fast and works well with Feedly, and it allows me to process links faster than other apps because it can default to iOS 8 extensions instead of custom sharing options. Nuzzel. I don’t only discover news and interesting articles through RSS, though. A new entry in my iOS setup this year, Nuzzel is based on a simple and ingenious idea: it shows you links people you follow on Twitter are sharing the most. By counting the number of times a link appears in your timeline, Nuzzel lets you catch up on what’s hot on Twitter using filters to select a time period, which is a great way to see what happened on Twitter if you haven’t been reading for, say, 8 or 24 hours. I’ve relied on Nuzzel to keep up with the Internet when I was on vacation or after a weekend I spent offline, and I open the app almost every day because, besides collecting links from people I follow, it also lets me discover links shared by people I’m not following. Pinner. When links don’t end up on MacStories, Evernote, or Instapaper, I archive them in Pinboard. I’ve been using Pinboard since 2009 and I’ve changed the iOS app I use to save links quite a few times over the years, primarily because of the terrific innovation that happened quickly in the third-party Pinboard client space. This summer, I started using Pinner 3 and I’ve stuck to it despite the number of Pinboard apps that were updated with support for share extensions (all of them). Pinner is clean, fast, and it lets me browse my account and public bookmarks by other users. 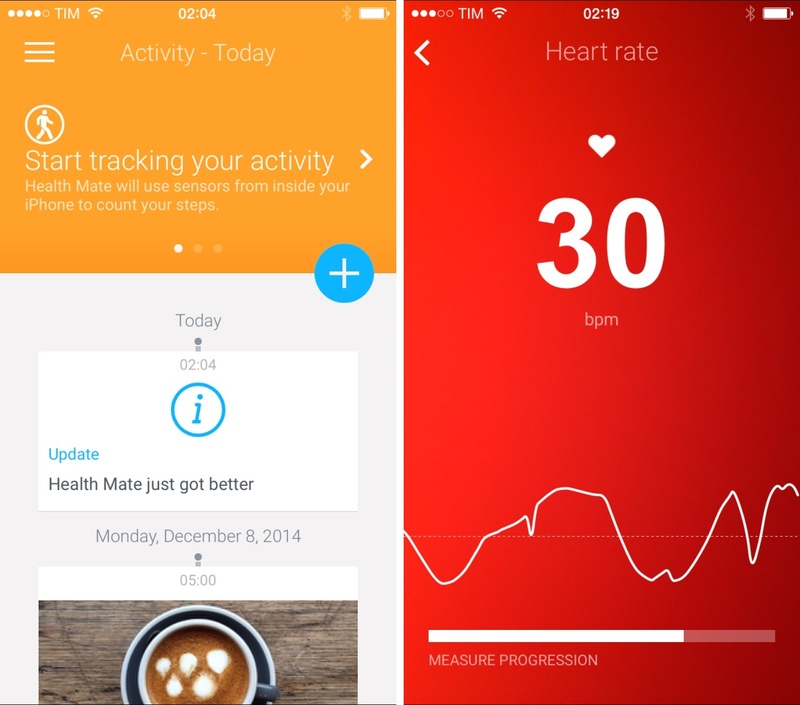 Withings Health Mate. I received a Withings Smart Body Analyzer for my birthday earlier this year, and I’ve come to rely on the Health Mate app as a central repository of all my associated weight, heart rate, and activity data. Health Mate automatically registers weight, heart rate, and air quality information when I step onto the Withings scale each morning, plus it can pull in data from connected services such as my Jawbone UP, MyFitnessPal, and even Apple’s Health app. I like the app because it has a Dashboard view where I get a visual summary of my current status and progress, a handy profile switcher to see users who have been added to the scale, and a Timeline screen where data points and summaries are listed in reverse chronological order. Jawbone UP. As a Jawbone UP24 owner, the Jawbone UP app is needed to set up the device and view collected stats on the iPhone. The app is clean and colorful, with bright bar charts showing progress for the current day, which is displayed with a timeline at the bottom. What I particularly like is the fact that the UP bracelet can send push notifications for reminders and goal completion, and also that Jawbone integrates with dozens of third-party services that can be configured directly from the Settings. I’m excited for the UP3, as I think it’ll be a solid fitness companion to the Apple Watch. Pedometer++. David Smith’s excellent pedometer app uses the iPhone’s motion coprocessor to count steps and show historical data for days. Pedometer++ can also count flights you’ve climbed if you have an iPhone 6, and it makes good use of color to indicate progress and whether you’ve been slacking. Simple and effective. Authy. I always enable two-factor authentication for my online accounts, and Authy is a Google Authenticator-compatible app that had a much better design than Google’s official client before it was updated, plus other nice features. Authy lets me quickly copy generated codes, it runs on the iPhone and iPad, and it has a widget that displays codes in Notification Center. Clean Links. I don’t like it when apps default to give me shortened URLs that hide the original source of a webpage, and I’ve built a few solutions over the years to fix the problem. 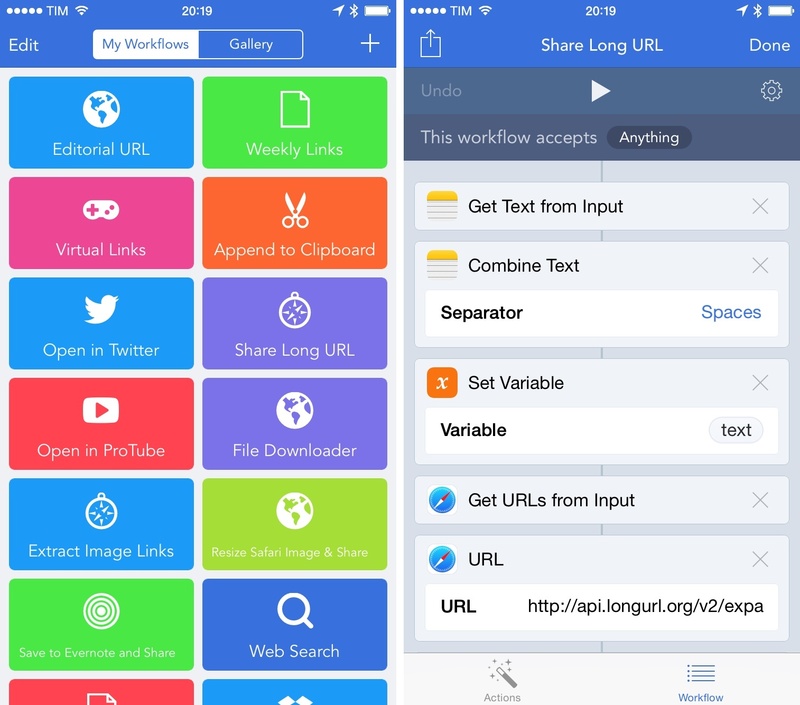 No workflow is, however, as simple and fast as Clean Links: the app’s sole purpose is to unfurl links and clean them up for you, so you won’t end up with pocket.co or youtu.be URLs anymore. Clean Links can be integrated with other apps through x-callback-url, which is a welcome plus. Emoji++. 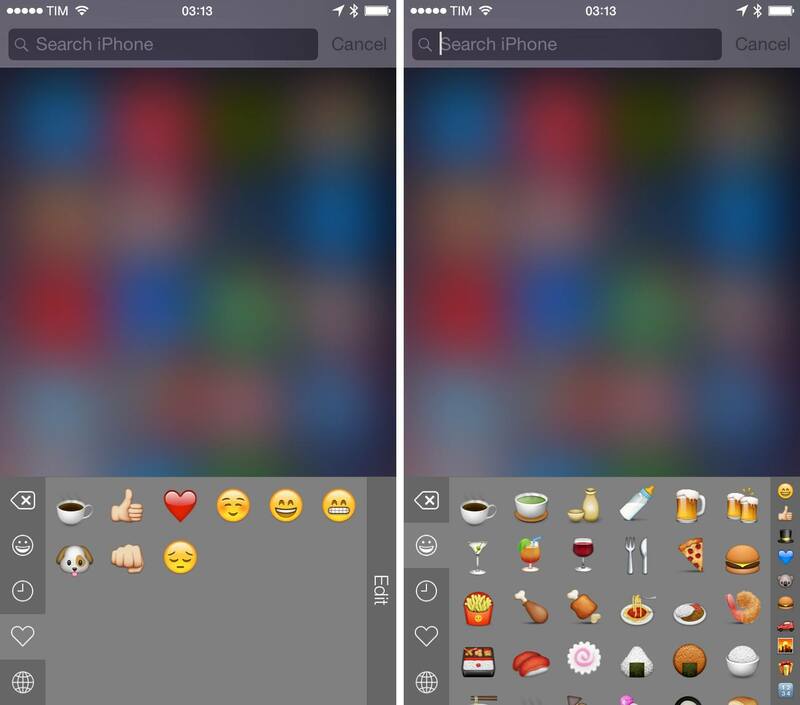 From the mind of the Underscore comes Emoji++, a better emoji keyboard than Apple’s. I’ve been using David Smith’s iOS 8 keyboard since it launched, and I can’t believe that Apple didn’t think of this concept before: you can create favorite emoji, browse by scrolling vertically, and everything is organized in a more coherent and practical structure. I tried to go back to the standard iOS emoji keyboard, but Emoji++ is simply better and now ingrained in my muscle memory. Google Maps. I can’t trust Apple Maps directions for my area and Google Maps data is simply too accurate for me to stop using it. Google Maps is the example of a must-have: it gets me home on a daily basis, it rarely messes up directions for me, and it saved me in a couple of scary situations. I like the new Material Design of the app, and the fact that it can be connected with actions to Workflow and Launch Center Pro is a good extra. Instashare. In spite of my reliance on iCloud and Dropbox to keep my data and documents in sync across devices, I often want to move bits of text and images between my iPhone and iPad quickly and without uploading them to a web service first. Instashare gets this done for me: the app is able to transfer anything you copy from one device to another over WiFi and Bluetooth. My use case is primarily limited to URLs and other text snippets I need to beam into my iPad for Editorial, which I often do using Instashare on the iPhone. KuaiBoard. I’ve always been a huge TextExpander fan, but, in the past year, I’ve found myself wishing for a more visual snippet expansion tool that wouldn’t require me to remember abbreviations. Thanks to iOS 8, I’ve started using KuaiBoard and it’s become one of my most used custom keyboards. 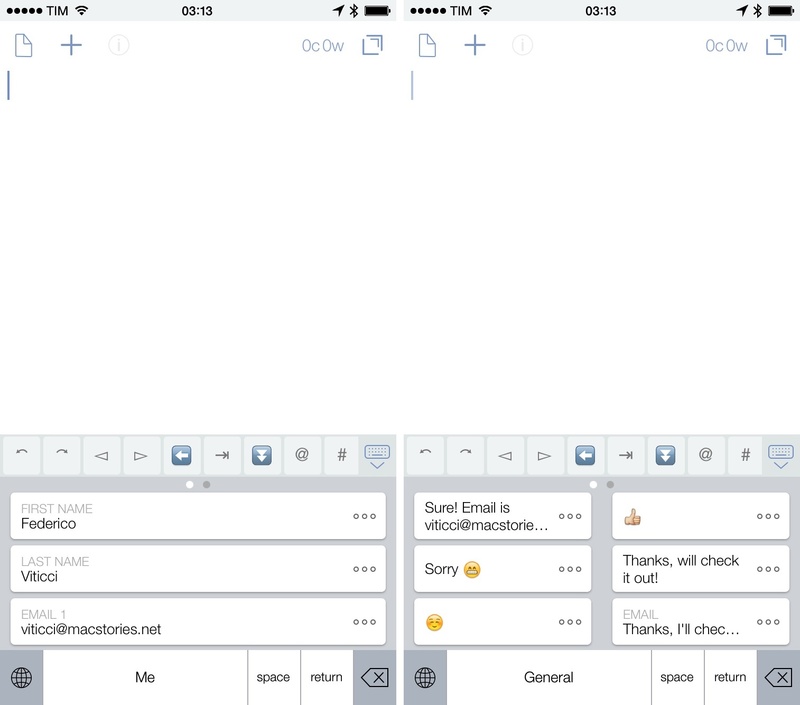 KuaiBoard shows snippets as buttons: you tap a button, and text is entered in any selected text field. You can create multiple categories for your commonly used pieces of text, and you can also label them and switch between minimized and enlarged layouts. I use KuaiBoard for personal information such as my name or email address (which I don’t want to type all the time) but also more particular data such as the address of my email server, tweet templates, email replies, and more. A handy timesaver. PCalc. I’ve never been into advanced calculators because I don’t need to perform complex calculations. PCalc is different because it’s completely customizable. 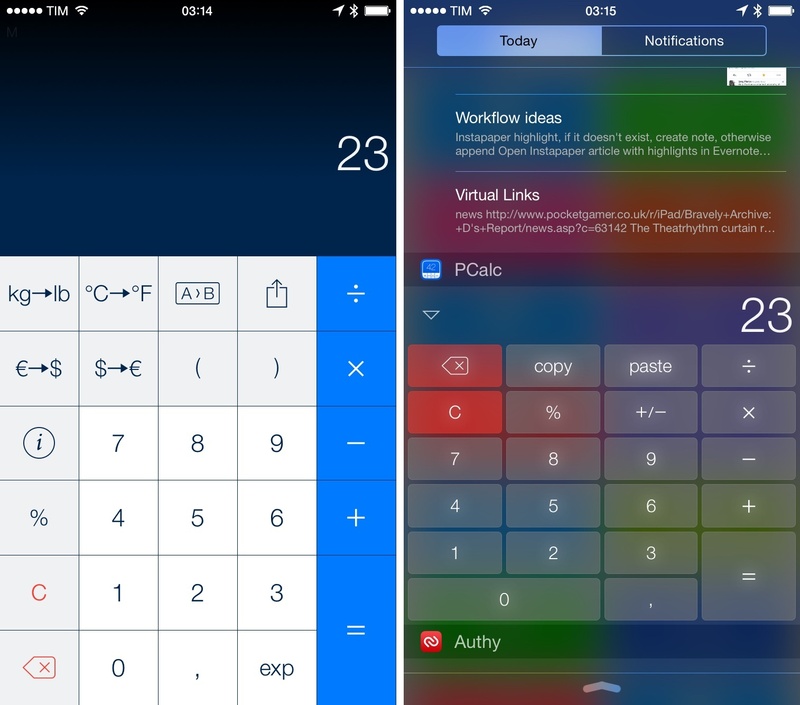 In the app’s iOS 8 update, developer James Thomson added the ability to create custom buttons that can do almost anything you want – it’s your own calculator kit, and it’s surprisingly easy to set up. 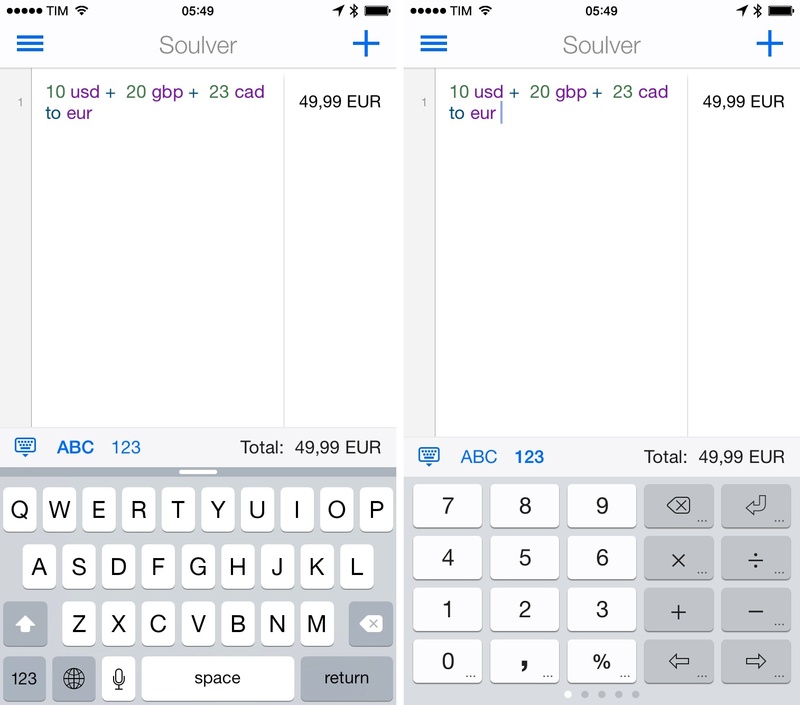 I created shortcuts to convert currencies and units, which has allowed me to consolidate the functionalities of a calculator and converter in a single app I’m using more and more. PCalc can sync custom layouts across devices, and it offers a widget that puts a mini calculator in Notification Center. I use the iPhone app every day when shopping or doing currency conversions for MacStories, and I put it on my Home screen for fast access as well. Pushover. I’ve been using Pushover with Zapier, and I’m a fan of the app’s simplicity and reliability. Pushover is a notification app that can alert you of changes from other apps and services; it’s extensible and it can be connected to the likes of IFTTT, GitHub, WordPress, and Zapier through official apps and third-party plugins. I use Pushover on iOS to be alerted with a custom sound when specific Twitter accounts post a new tweet, when Apple uploads a new video to YouTube, or when they have a new press release. Pushover notifications with Zapier are fast, the custom sounds catch my attention so I know it’s something important, and the iOS app can even open an associated URL upon tapping a notification (Pro tip: you can construct custom URL schemes to open with Pushover when setting up a Zapier workflow). Screens 3. Edovia’s excellent VNC app for iOS turned four this month and I still use it every day to log into my Macs and control their screen remotely. My usage of Screens increased after I set up a Mac mini at Macminicolo, and I particularly like how Edovia added a new trackpad mode and improved clipboard sharing in the past year. Screens ensures I can always keep an eye on my OS X server, and it’s one of the apps I trust the most. Soulver. Developed by Acqualia, Soulver combines a notepad and a calculator in what appears to work like a spreadsheet but is actually much simpler. Soulver understands natural language and can calculate results over multiple lines of text, which is handy if you want to jot down details and numbers and create connections later. Soulver can assign variables, convert currencies and units, and it can even convert from multiple units to a single value at the same time. Soulver is an invaluable tool, unique in what it brings to iOS. Witness. This app hasn’t been updated in a while, but I still use it every day and it gets the job done for me. Witness uses your Mac’s iSight camera as a remote webcam you can control from your smartphone, which will receive a push notification if motion is detected. Witness can lock your Mac with a passcode (or your login password), take pictures and videos when it detects motion, and, even if the app hasn’t been updated for the iPhone 6 or iOS 8, it still works reliably and I like to keep it around. World Time Widget. For my work at MacStories and Relay, I collaborate with people from all around the world and, for this reason, I need to be able to convert time zones quickly. There are hundreds of time zone widgets on the App Store, but I like World Time Widget as it uses a horizontal layout rather than a long list. World Time Widget has a small footprint on my Today view and it’s useful to keep around. 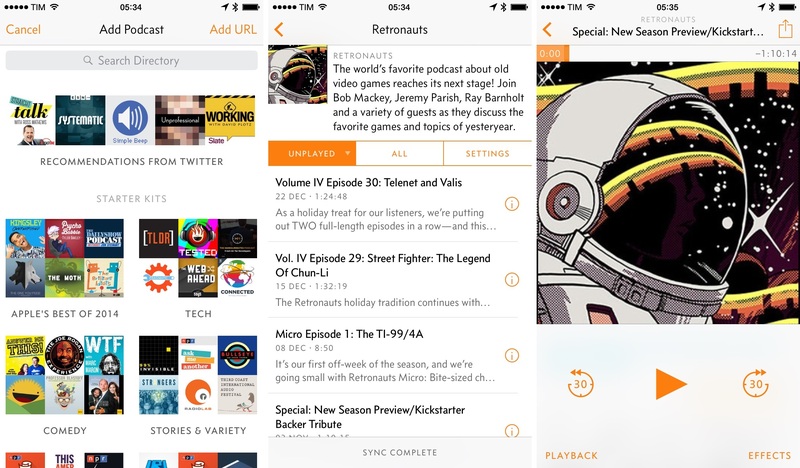 With its clean design and useful audio effects, Overcast is my iPhone app of the year. With Overcast, Marco Arment managed to reinvent a somewhat stale app category by focusing less on the file management aspects of podcasts and more on the experience of listening and sharing. I use Overcast every day and its effects make my favorite shows sound better and take up less of my time without odd artifacts. Overcast is a remarkable visual and technical achievement, and my must-have podcast app for iPhone. Next year, I think my usage of the iPhone will remain unchanged: a pocket computer that has all my essential apps in case I need them. In 2014 more than ever, it was clear to me that I prioritize my iPhone for tasks such as taking pictures and managing them, listening to podcasts and music, or staying in touch with people via Messages, Twitter, and Dispatch. My iPhone can be like my iPad when it comes to productivity apps, but its screen is too small for me to comfortably work on it every day. I do work on my iPhone – in a different way. The iPhone is a pocket computer: it sounds obvious, but it’s always there, packed with great software, ready to get things done or solve problems quickly. I wouldn’t have prolonged writing sessions on it, but I can trust my iPhone knowing that it can get things done if I don’t want to grab my iPad. I’m expecting the trend of Universal apps to continue in 2015 and I believe that, between the Jawbone UP3 and Apple Watch, my reliance on the iPhone as a health companion and hub will dramatically increase. As usual, let’s check back in a year.